Did you know Ted Williams played ball in Minnesota? At age 19, Ted Williams (right) spent the entire 1938 season playing for the Minneapolis Millers, the Boston Red Sox AA affiliate. In his year in Minnesota, he hit .366 and slugged .701. As the youngest guy on the team, led the team in every offensive statistical category: games played (148) hits (193), doubles (30), triples (9), homers (43), and at 6′ 3″, 205 lbs, he led the team in those categories as well. Willie Mays (35 games in 1951) and Carl Yastrzemski (1960) spent time in in a Millers uniform before their pro debut as well. The Millers have their roots as far back as 1885 as a part of the Western League. On the other side of the Mississippi were their rivals: the St. Paul Saints. The Saints arrived in St. Paul in 1894 when Charles Comiskey bought the team and moved them over from Souix City, Iowa. They joined the Western League as well and the Minneapolis/St. Paul rivalry was established. But following the 1899 season, Comiskey’s club joined the newly formed American League, and moved the club away to become – you guessed it – the Chicago White Sox. In 1902, both the Millers and Saints became charter members of the minor league American Association. By the late 30’s the Saints would become affiliates for the White Sox and later the Brooklyn/Los Angeles Dodgers. Roy Campanella, Lefty Gomez and Don Zimmer were a few of the players to come through St. Paul during those years. The played 22 games against one another every season. Sometimes on major summer holidays – Labor Day and Fourth of July, for example – the teams would play home and away doubleheaders. They would play in the morning at one ballpark, and then the fans and players would travel by streetcar to the other side of the river for an afternoon game in the other team’s park. As expected, the two cities grew to hate one another. Violence would break out in the cities following these ballgames (1923 was apparently the worst of the brawls) The cities kept trying to 1-Up one anthers buildings. In fact, in the 1950s, both cities built brand new ballparks – separately – in hopes of reeling in a Major League team. There are even rumors that they would kidnap census takers so that the other city wouldn’t overtake the other in population. In 1960, both the Saints* and the Millers packed up and left town. The Millers became the Seattle Rainiers, and the Saints became the Omaha Dodgers. * – The Saints returned to St. Paul in 1993 and are there today as a part of an independent league. They’re owned by Mike Veeck (son of Bill Veeck) and BILL MURRAY!!!!! Why the moves? Because the MLB had just awarded the area with their first Major League ball club: the Washington Senators were moving from D.C. to become the Minnesota Twins. Technically, it was the Millers who had reeled in the big tuna. The team settled on the Minneapolis side, but without the Saints, St. Paul was going to have to root from across the river. And by the late 1960s, significant healing had taken place between the two. The team name itself was an intentional move to unite the two groups. It isn’t the “Minneapolis Twins,” but the “Minnesota Twins” – in fact, they wanted to call them the Twin City Twins, but that was too repetitive so they included the whole state. They commissioned a freelance illustrator from St. Paul named Ray Barton to create the team logo for which he got paid a whopping $15. Today, that logo is featured prominently at Target Field. In straight away center field, a giant state of Minnesota borders two goofy looking men and a river with a bridge over it. The men are both wearing baseball uniforms – one with an “M” on the sleeve and one with an “S” and a “P” and a “T” on the chest – and they’re reaching across the river and shaking hands. They’re the real Twins – Minnie and Paul – the two cities united together by this new team. Now, I’m not going to act like the arrival of Major League Baseball has completely reconciled the ill will on both sides of the Mississippi. There is still significant social segregation. There are strong tribal identities as well. But the arrival of the Twins truly united a previously hostile relationship. Regardless which side of the Mississippi someone lives on, they can come together and cheer for their Minnesota Twins. The entire Twins franchise is founded on principles of reconciliation and hospitality to one another. How about that? I think I’ll center on that for my book. I’ve already got a good start here. Baseball. Bringing people together. Cities, even. Okay. Moving on. Let’s talk about Target Field. It was built in 2010, and is basically perfect. It features tons of sandstone: the exterior, the section faces inside the park, even the top of the dugouts. 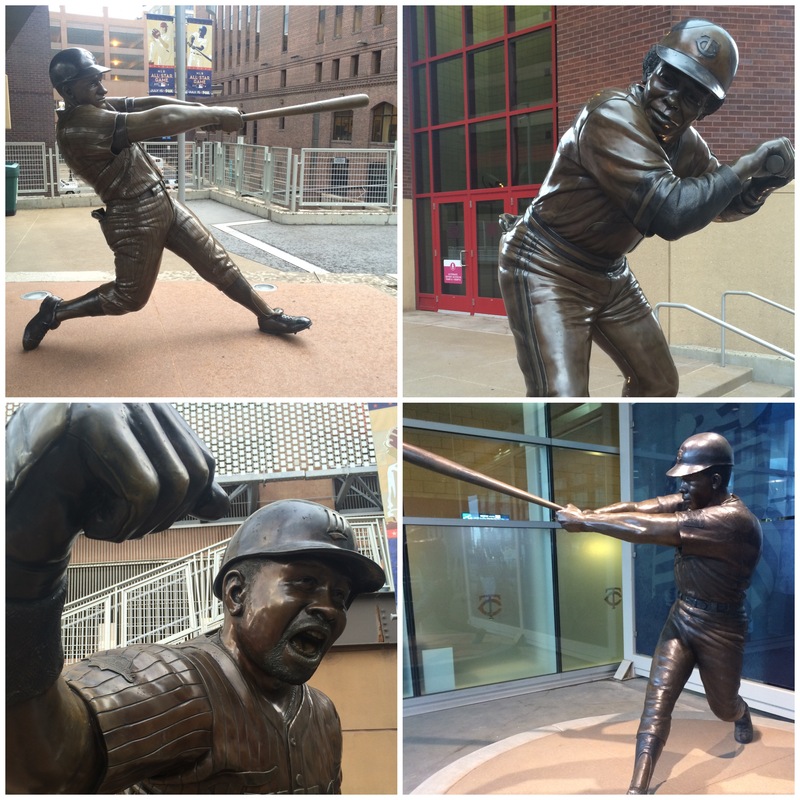 It has oversized statues of five Twins greats at each of the gates to the park. Harmon Killebrew extends his gorgeous swing in front of Gate 3. Kirby Pucket celebrates his 1991 World Series walk off HR in front of Gate 34. Kent Hrbek stands outside of Gate 14. Rod Carew has his bat cocked awkwardly outside Gate 29. And Tony Oliva swings outside Gate 6. Gates 3, 6, 14, 29 and 34? Weird. Those are all retired Twins numbers. Hmm. The final retired number: 10, worn by Tom Kelly who – despite his overall poor winning percentage (1140-1244, .485) – managed the Twins to World Series championships twice (’87 & ’91) in his 16 years with the team (1986-2001). There’s a giant Gold Glove outside the park as well. Fans get to climb up on to it and get their picture taken. There’s plaque of all the past Twins Gold Glove winners with it. The Twins haven’t had many Gold Glovers, but the ones they have won it a bunch. They have 41 total GGs over their 53 years as a franchise, 30 of which are from 5 guys: Jim Kaat (won 11 GGs with the Twins), Torii Hunter (7), Kirby Puckett (5), Gary Gaetti (4), and Joe Mauer (3). Target Field seats 42,000, but it feels like way less. The ballpark feels very intimate. The lower sections extend much further back than the upper decks, which are basically just stacked on top of each other up high and very shallow. I heard that the ballpark was constructed within 4 city blocks, a 2-by-2 square, so everything feels squeezed in on top of the action. Not in a bad way at all, but in a comfortably communal way. That Minnie & Paul logo in centerfield is awesome too. It does all sorts of light up dancing moves when the Twins do different things on the field. It goes bizerk when they hit a homer. a line traces the MN border when a run is scored. It blinks when the pitchers strike someone out or throw a scoreless frame too. 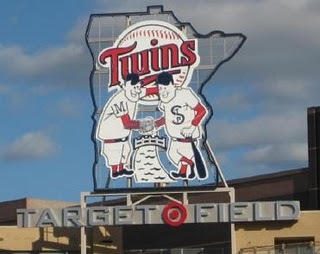 * – Ever noticed how the letters W-I-N are the only letters underlined in the Twins logo? So subtle. So brilliant. I went to the game with my friends Jourdan and Jeff. Jourdan interned for me at Jacob’s Well a couple years ago, and Jeff, her husband, is a pastor at a church called Mosaic in East St. Paul. The mission for their church centers on hospitality: Stranger, Guest, Host. Extending themselves out of the church and into the community around them. I’m sensing a theme here. I want to write something about lakes and mosquitos and snow somewhere in here too, but I’ve already spent too much time on this post. Time to get to the game wrap. The Twins were playing the White Sox, and John Danks got spanked. As I wrote in my pre-trip post on Tuesday, the Twins have historically owned Danks – Joe Mauer especially. In fact, basically everyone but Kurt Suzuki bats really well off the Sox lefty, which would explain why Suzuki sat out that night. The Twins lit Danks up, as expected, for 7 runs on 11 hits in 4.2 innings. The guy was absolute meat and the Twins hit the ball hard all night. The bullpen wasn’t much better for the rest of the game either. Overall: Twins scored 11 runs on 19 hits which meant Twins fans saved 19 cents per gallon at SuperAmerica gas stations on Thursday. Sweet. Eduardo Nunez went 4-6 and was a HR short of the cycle. Kennys Vargas hit a 429 ft bomb to LF. The other Eduardo (Escobar) went 3-4 with a triple and a walk. Minnesota batted around in the 5th inning – the inning that chased Danks from the game – and my scoresheet ended up looking all messy and gross. Of course, that could’ve also been because of the rain that kept rolling in and out. It caused one short rain delay at one point lasting maybe 15 minutes. I continue to have really good luck when it comes to weather on this Ballpark Tour. Trevor May got his first career win. Previously he was 0-4 in as many starts with an ERA over 10. He was working great through three innings but started laboring a bit in the fourth and fifth. He gave up 3 runs in 5 innings, but after the Twins batted around, those runs pretty much didn’t matter anymore. Twins win. 11-4. That logo was extremely busy. Twenty-four down. Six to go. Up Next: Tampa Bay Rays. Next Next post: The Royals are 79-62. So let’s talk completely in hypotheticals about the final 3 weeks of the season.